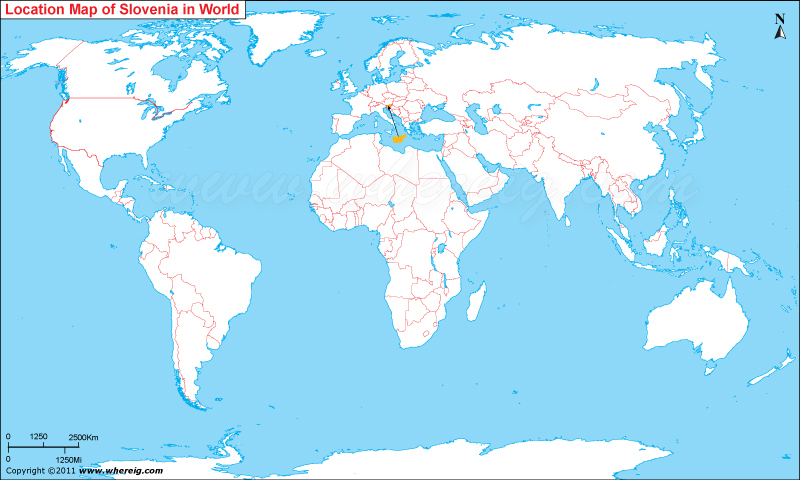 Where is Slovenia located on the world map? The given Slovenia location map shows that Slovenia is located in the central part of Europe. Slovenia map also shows that Slovenia shares its international boundaries with Hungary in the north-east, Austria in the north, Italy in the north-west, and Croatia in the south. Besides, it has also small coastline along the Adriatic Sea. The climate type of the country is continental in the interior and Mediterranean in the coastal region. Ljubljana is the largest and capital city of the country. Slovenia got its independence in the year 1991. The government type of Slovenia is a parliamentary democracy republic featured with a multi-party system. Though the head of state is the president, who is elected by popular vote for five years term and maximum for two terms but he is actually an advisory body. The executive and administrative authority is vested in the government of Slovenia headed by the Prime Minister and the council of ministers. Besides, Slovenia is the member of the European Union, the Eurozone, NATO and OECD. The economy of the country is quite fast growing and depends upon the various sectors including trade and commerce, industries, finance and business etc. Moreover, tourism in the country is also one of the growing industries. The diversified landscapes i.e. Alpine in the northwest, Pannonian in the northeast, Dinaric in the southeast, Mediterranean in the southwest attract thousands of tourists every year.